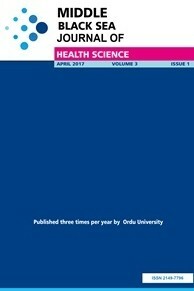 The Middle Black Sea Journal of Health Science is published by Ordu University Institute of Health Sciences on behalf of the Middle Black Sea Universities Collaboration Platform and is given free Digital Object Identifier (DOI). All opinions and reports in the articles published in the Middle Black Sea Journal of Health Science are those of the authors. The editors and the publisher do not accept any responsibility for these articles.